Piggy's Revenge : Time is getting short. I rode the 20 miles loop of Piggy's Revenge this last week-end. 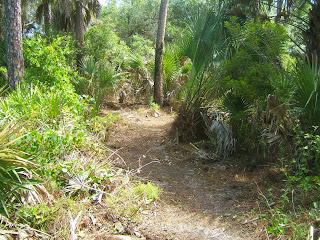 It is a nice loop with only a mile or so of bumpy trail and the rest is smooth and easy to ride. There will be a bail out point at the 14 miles mark so average rider should be able to do it in around 2 hours of riding. 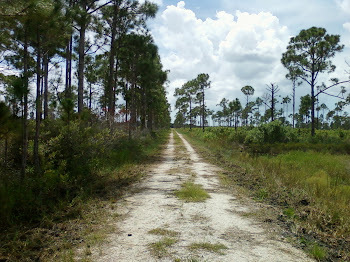 During my ride, I crossed paths with a dozen deer, about 10 wild turkeys, several gators and the usual pigs roaming around. If you are a beginner or intermediate rider worried about the challenges of Piggy. the 20 mile loop will be a perfect ride to try and stretch you riding abilities. If you don't try something out of your comfort zone you don't improve. Consider challenging yourself and a friend in the only local off road endurance event. The whole course will be marked so you will not get lost and after the ride, you will enjoy some homemade sausages hot off the grill and take home a t-shirt to remember your accomplishment. Join SCORR for a fun day in the wilds of the Carlton. You must sign up before the event. All the money raised helps us improve your local trail system. Shortly I will determine the final routes for the 40 and 60 milers then I will start working on the GPX files.They will get posted soon.This year I have explored the whole property and picked the best routes possible.We will have a beverage stop around the 28-29 miles mark.Tommy O. will be there in his special oasis.He did mention something about dancing girls.It should be quite fun!